Forget the Russian Revolution, the Bolsheviks and the aristocracy, the Ural Mountains and even the translations. What I love most about Dr. Zhivago is the love story. So slowly developing between Yuri and Larissa, their affair is tender and sweet, perhaps even more so for its backdrop of war. 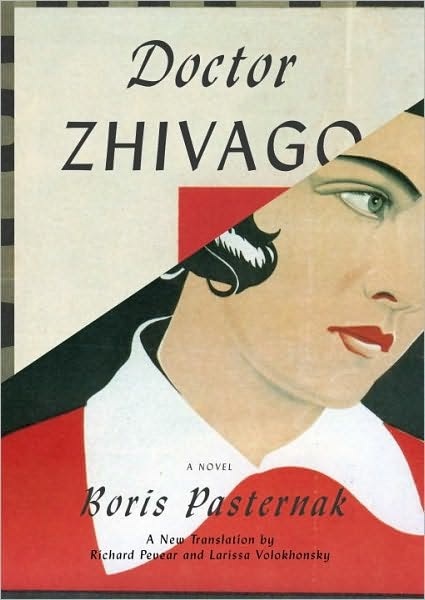 I read Boris Pasternak’s novel several years ago, the cover of which I’ve pictured here. It was translated by Max Hayward and Manya Harari, and lest I sound like I’m spitting in the eye of Richard Pevear and Larissa Volokhonsky, I loved it. The Brothers Karamazov and War and Peace translations by Peavear and Volokhonsky were outstanding. I read them both, and I enjoyed them both very much. But somehow, their translation of Dr. Zhivago, to which the New York Review of Books declared “the English-speaking world is indebted” leaves me a bit surprised. There’s nothing wrong with it, of course. It just reads a bit like “bricks are falling out of one’s mouth” as a pastor I know described the American Standard translation of the Bible. It’s choppy somehow, and I had to read it very slowly so as not to get lost, while I practically breezed though the translation you see above. I don’t know, maybe it’s just me. In any case, I love Russian novels. I love Dr. Zhivago, no matter who’s bringing it to me. And I look forward to discussing it in further detail the next time it comes around, which will be for Book Two on November 30, 2010. Read-along hosted by the lovely Frances. I can hear that "bricks in the mouth" effect in the excerpt you give. "One wants so much to be part of the general inspiration!" or "What wouldn't I give for it not to be there". I read a chunk of the new translation that was excerpted in The Hudson Review recently and had the same feeling. The subject matter and characters were undeniably interesting, but something about the prose was – I don't know what. Not what I normally think of as good prose. I'm reading the Max Hayward & Manya Harari translation (although I don't like my front cover – your one is much nicer, mine looks like I'm reading a really low quality trashy novel! Sorry for the rant.) I had been reading it thinking what was I missing from not reading the new translation. A classic case of thinking the grass is always greener…I'm enjoying it but keep thinking about the love story – they're both married – and it's not as if they had horrendous marriages either – but then I think that makes me sound all puritan. So then I'm just in a quandary so try not to think too much about that side. (I had similar thoughts with Anna Karenina. )I am really enjoying it though, I love the musings on the soul, on life and living. Joan, I have reverted to my Hayward and Harari translation for the rest of the novel, that's how much I prefer it. Isn't it funny, though, how it's our nature to long for what we don't have? Or, that's one of my tendencies, anyway.It's very true they're both married. Larissa and Yuri have an out and out affair with each other, and while that goes against my Christian principles, somehow I find myself quite compassionate toward them. Let's talk about their love as it develops more fully in Book 2.The musings on soul, life and living (as well as love) are the reasons I love the Russian (and French) authors so very much. I've never read this one or seen the movie so the story is completely unspoiled for me. I know that the translation is key here so appreciate your opinion on that. I'll look forward to seeing if you change your mind about this translation after you've read further in the book. So glad to hear you say this about the new translation because it strikes me as leaden and, to borrow from Nabokov, clumsy. Trying to hang in there so taking a short break before Book Two. To be honest, Bellezza, this is feeling like a chore. VERY tempted to go pick up the older translation you feature here for the second half. Thanks so much for joining the read! Kathleen, probably the film with Omar Sharif and Julie Christie will seem terribly dated to you, and I hear the one with Keira Knightly is very good (wait, can twelve year olds act? )…still, I loved the winter scenes in the first film which is what I remember most. That, and the troika going over the snow. This novel is lovely, but one must have the right translation for one's enjoyment.Frances, stop. Get the old translation now because I hate to see this beautiful novel spoiled for you. It's better than The Brothers Karmazov, I promise you, and you're not getting any of the pleasure if you need a break. I know what you mean, though; I abandoned my Pevear and Volokhonsky for the older copy in my bookcase. Chagrined as I am to admit it. What! Four year olds can act! I read the Hayward/Harari translation many years ago. I'm guessing sometime around 1995 since that was the year I read Anna Karenina and noted that book in my first reading journal. 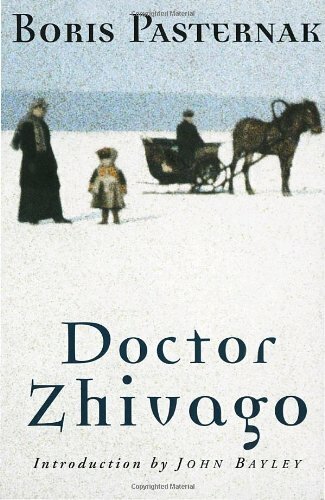 I wrote that Anna Karenina was good, but not as good as Dr. Zhivago. One of these days I'll re-read both! I'm very tempted to pick up a different translation now as to be honest it can only be an improvement. Maybe I'll get an older copy from the library? I'm very interested to look deeper into the translation issue. I don't remember finding my previous reading of this, with the old translation, as hard going as I am finding it now. Considering I read it at 16 the first time round, I am certain I would have given up if I had found the prose as troublesome as I am finding it now, eight years later.I love the phrase 'bricks falling out of the mouth' – that IS what this translation feels like, a little. It's very choppy, very heavy, very incorrect in its syntax. I'm going to pick up the other translation from the library and do some close comparison to see the differences.I so enjoyed the Anna Karenina translation Pevear and Volokhonsky did and I'm disappointed their Doctor Zhivago doesn't have the same lyrical quality. However, in their defence, Pasternak's Russian was, so I've read, rather idiosyncratic, and as such, I can imagine it's a bit of a beast to translate. Ann Pasternak's article, while fascinating, was a little too damning, and I did feel like saying to her, 'so why didn't you translate it yourself?!'. Aside from the translation though, I think the story itself is just different from what I remember. I don't recall there being this little of Lara, and a relative omission of any dialogue or relational development between the characters. I'm very much hoping the last section will redeem the plodding first section! I'm finding the discussion about translations fascinating as I'm trying to decide which translation of War & Peace to get (yes, I know, I've been thinking about this for months…)When I do get around to reading Dr. Zhivago, I'll go with the Hayward/Harai translation!